We have lingered in the chambers of the sea By sea-girls wreathed with seaweed red and brown Till human voices wake us, and we drown. The algae are a large informal grouping of heterogeneous, polyphyletic or paraphyletic groups of primarily aquatic organisms ranging from tiny, flagellated unicells only a few microns in diameter to multicellular organisms up to 80m long, such as the giant kelps (Graham and Wilcox, 2000). Unlike vascular plants, the algal body (thallus) lacks organ differentiation, although some forms have developed structures functionally similar to roots, shoot axes, and leaves. Most algae are photoautotrophic; some forms, however, are mixotrophic and derive energy both from photosynthesis and uptake of organic carbon by osmotrophy, myzotrophy, or phagotrophy. A few forms have reduced or lost their pho-tosynthetic capacities and are entirely heterotrophic. Extant algae are classified on the basis of a complement of features that do not normally lend themselves to fossil preservation. These include the type of pigments present, storage products, type of flagellation if present, and degree of cellulariza-tion. Moreover, molecular, biochemical, and ultrastructural characteristics are increasingly important in algal systemat-ics and phylogeny (Brodie and Lewis, 2007). Although algae thrive in a spectrum of habitats, including Antarctic ice, rock and tree surfaces, animal fur, human and animal skin, and desert sand, most forms are aquatic. Algae are critical in modern aquatic ecosystems, not only in producing oxygen for other aquatic life, but also in serving as primary producers of organic matter at the base of the food web (Round, 1981). Stands of larger algae (e.g., kelp forests) are used by animals as shelters and nursing grounds; other algae are pivotal in the physiology of some aquatic animals and involved in various vital processes (e.g., symbioses with corals [cnidarians]). Still other algae are structural contributors to the formation of reefs. With this recognition of the ecological significance of extant algae, a sound record of the evolutionary history of these organisms, including the roles they played in biological and ecological processes in the past, is critical in understanding the complexity and evolution of both ancient and modern aquatic ecosystems. Molecular clock hypotheses suggest that the first algae occurred on Earth during the late Paleoproterozoic or early Mesoproterozoic, some 1.5 Ga or even earlier (Yoon et al., 2004). This date corresponds with the long fossil record of these organisms, which can be traced into the Precambrian. Despite the often fragile nature of the plant body of many algae, there are numerous algal remains throughout the fossil record. Some algae have contributed to the formation of petroleum and thus are chemical fossils, whereas others are represented by thousands of feet of accumulated siliceous diatom shells. Algae that precipitate or deposit calcium carbonate, CaCO3, are often common in the fossil record. The actual algal thallus may not be preserved, but in many instances, the calcareous structures can form extensive deposits (Coniglio and James, 1985). Calcareous algae first appear in the late Neoproterozoic and become widespread during the Cambrian (Riding and Voronova, 1985). Among extant algae, ~ 10% of benthic multicellular forms are calcified, with about 90 genera known for the red (Rhodophyta), 10 for the green (Chlorophyta), and 2 for the brown algae (Phaeophyceae) (Luning, 1990; Kraft et al., 2004). Various calcareous algae play a major role in the formation of modern coral reefs (FIG. 4.1) (Wood, 1998), especially some coralline red algae (see section "Rhodophyta") and the green alga, Halimeda (see section "Ulvophyceae"). Although sections of the fossils rarely indicate any of the cellular details of the original organism, the existence of calcified algae is determined by the presence of calcium carbonate that accumulated around the thallus. Cellular details of fossil algae can be preserved in certain depositional environments, for example, various Proterozoic organisms, including various algae, have been preserved in cherts. 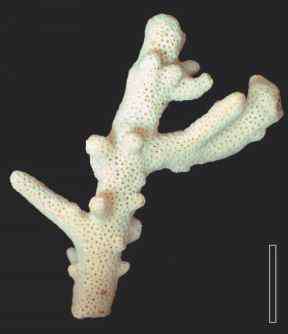 FIGURE 4.1 Coral (Extant). Bar = 2 cm. document uncalcified macroalgae throughout geological history is probably because algal thalli, with no real strengthening tissue, are not easily preserved (Tappan, 1980). Many marine forms may live in the intertidal zone, where they are easily destroyed after death. In addition, they do not produce characteristic skeletons that can be used for comparison with modern forms. As a result, hypotheses on the affinities of uncalcified fossil macroalgae, especially those preserved as impressions and compressions, are often formulated solely on basic morphological comparisons with modern forms. These scenarios thus remain speculative and place serious constraints on the interpretation of the roles these plants played in ancient ecosystems. Numerous impression and compression fossils were described, especially in the nineteenth and early twentieth centuries, that superficially resembled algae; these fossils, however, lacked certain distinctive features, so it was difficult to establish their biological affinities. To classify such forms, a system of artificial morphotaxa based on a few characteristic macromorphological traits was instituted. To a certain degree this taxonomy is still used today. For example, within the older literature there are numerous references to the morphogenus Fucoides (Harlan, 1830; Taylor, 1834; Lesquereux, 1869). This taxon was instituted by Brongniart (1822), for fossils which he interpreted as similar to the extant brown alga Fucus and similar forms in the order Fucales (Phaeophyceae). The algal nature of most of these structures, some of which are as old as the Cambrian, however, has been challenged and many of them today are thought to be ichnofossils (Jensen and Bergstrom, 1995), graptolites (Bulman, 1963), or different sedimentary structures. The morphogenus Algites was established by Seward (1894) for fossils that he thought were probably algal, but which, because they lacked reproductive or internal characteristics, could not be assigned to any modern group. Over the years, Algites has become a "wastebasket taxon" for all sorts of enigmatic fossils that are similar to algae in basic organization. One species, A. enteromorphoides from the Devonian of Missouri, is composed of narrow, branching filaments and has been suggested to be a member of the Chlorophyta (Basson and Wood, 1970). Thallites is another morphogenus used for fossil thalloid plants that may have been either algae or bryophytes. Webb and Holmes (1982) suggested that these fossils be referred to as intermediate thalloid fossils. Thallites dichopleurus (Middle Pennsylvanian) is a dorsiventral thallus with a well-developed midrib (DiMichele and Phillips, 1976). 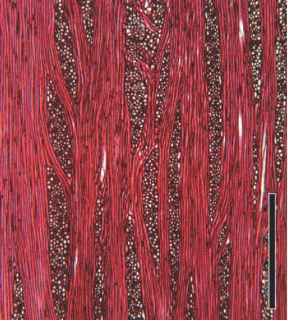 The undulate lamina is slightly less than a centimeter wide, and the entire thallus dichotomizes several times. Latex peels made from the surface of the specimen and examined in the scanning electron microscope show epidermal cells of the midrib and thallus to be of different sizes; no epidermal appendages or openings are present. Other species of Thallites from Mesozoic rocks have been delimited on the basis of size, character of the margin, and nature of dichotomies. Since uncalcified macroalgae are not easily preserved, one of the most important discoveries in paleoalgology is numerous, uncalcified macroalgal floras that are well preserved as carbonaceous fossils in Precambrian and Cambrian marine rocks from North America, Europe, and especially China. Over the last few decades, paleobotanists working on the material from China have been particularly productive in deciphering these organisms (Cao and Zhao, 1978; Du and Tian, 1985, 1986; Duan et al., 1985; Y. Zhang, 1989; Zhang and Yuan, 1992; M. Chen et al., 1994; Steiner, 1994; R. Yang et al., 1999). Today many forms can be assigned to one of the major groups of algae with some confidence, based on structural similarities to extant forms, although the affinities of others still remain inconclusive.